109-111 Commonwealth are located on the north side of Commonwealth, between Clarendon and Dartmouth, with the Clarendon Street Playground to the east and 113 Commonwealth to the west. 109 Commonwealth and 111 Commonwealth were built ca. 1872 for real estate dealer Henry Whitwell. Designed as a symmetrical pair, the entrances originally were at the first floor with a single stairway that spanned both houses. The entrances were lowered to street level sometime before 1914. 109-111 Commonwealth were built on the eastern two-thirds of a 84 foot wide lot that Henry Whitwell purchased from the Commonwealth of Massachusetts on March 28, 1871. He sold the western 28 feet to Walter Hastings on September 26, 1876, who built 113 Commonwealth on the lot. Click here for an index to the deeds for 109-111 Commonwealth. On January 12, 1876, 109 Commonwealth was purchased from Henry Whitwell by Elizabeth Clarke (Greene) Crowninshield, the wife of General Caspar Crowninshield. They previously had lived in Brookline. Caspar Crowninshield served in the Civil War from 1861, rising to the rank of Colonel. He served with Sheridan through all the campaigns in the Shenandoah Valley and in the Appomattox campaign, and was present at Lee’s surrender. On May 20, 1865, he was brevetted Brigadier General and was mustered out of service on June 20, 1865. Elizabeth Crowninshield died in December of 1885. 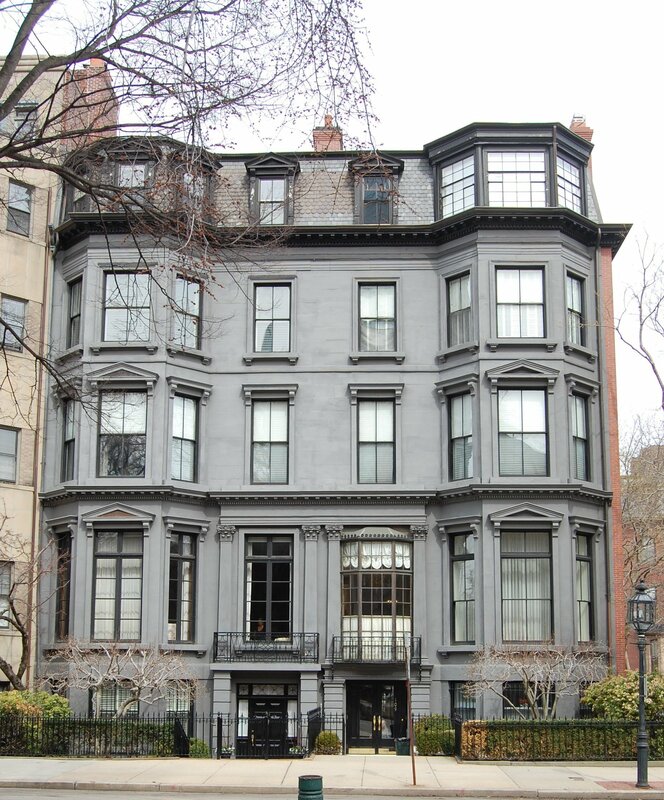 Caspar Crowninshield continued to live at 109 Commonwealth, joined in about 1893 by his son-in-law and daughter, landscape architect David Hill Coolidge, Jr. and Harriet Sears (Crowninshield) Coolidge. In 1892, they had lived in an apartment at 411 Marlborough. Caspar Crowninshield died in January of 1897. After his death, David and Harriet Coolidge separated. She moved to Grand Forks, North Dakota, to secure a divorce, and he moved across the street, to 114 Commonwealth, to live with his parents, David and Isabella (Shurtleff) Coolidge. 109 Commonwealth was not listed in the 1898 and 1899 Blue Books. On July 18, 1899, 109 Commonwealth was acquired from Caspar Crowninshield’s children (Harriet Sears (Crowninshield) Coolidge and Elizabeth Copley (Crowninshield) Peabody, wife of George Lee Peabody) by Helen Augusta (Nichols) Cabot, the wife of Samuel Cabot, III. They previously had lived at 81 Beacon. They also maintained a home in Canton. Samuel Cabot was a manufacturer of wood preservatives and stains, coal tar-based disinfectants (called Cabot’s Sylpho-Nathol), and building insulation made from eel grass (called Cabot Quilt). His firm was a pioneer in developing a profit sharing plan for its employees. Samuel Cabot died in November of 1906. 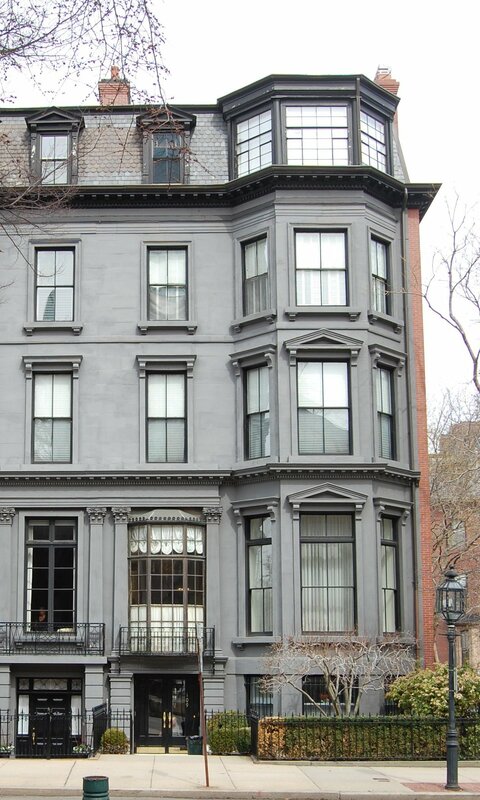 Helen Cabot continued to live at 109 Commonwealth with their two children, Elizabeth and Samuel Cabot. Elizabeth Cabot married in December of 1908 to Dr. Henry Lyman, after which they moved to 36 Commonwealth. Dr. Lyman was a physician and biological research chemist at Harvard Medical School. Samuel Cabot married in October of 1909 to Nancy Graves. After their marriage they lived at 109 Commonwealth with his mother. Samuel Cabot succeeded his father as the owner and chief executive of Samuel Cabot Inc. (later Cabot Stains). They continued to live at 109 Commonwealth during the 1915-1916 winter season, but moved thereafter to Chestnut Hill. During the 1915-1916 winter season, Helen Cabot was joined at 109 Commonwealth by her sister-in-law, Susan (Shattuck) Cabot, the widow of Dr. Arthur Tracy Cabot (Samuel Cabot’s brother). She previously had lived at 36 Commonwealth with Herbert and Elizabeth (Cabot) Lyman. Susan Cabot also maintained a home in Canton. She no longer was living with Helen Cabot by the 1916-1917 season, and probably had moved to her home in Canton. Helen Cabot died in May of 1917. 109 Commonwealth was inherited by Elizabeth (Cabot) Lyman and Samuel Cabot. By the 1917-1918 winter season, 109 Commonwealth had become the home of Henry and Elizabeth (Cabot) Lyman, who previously had lived at 36 Commonwealth. They also maintained a home, Pakeen, in Ponkapoag, Massachusetts. 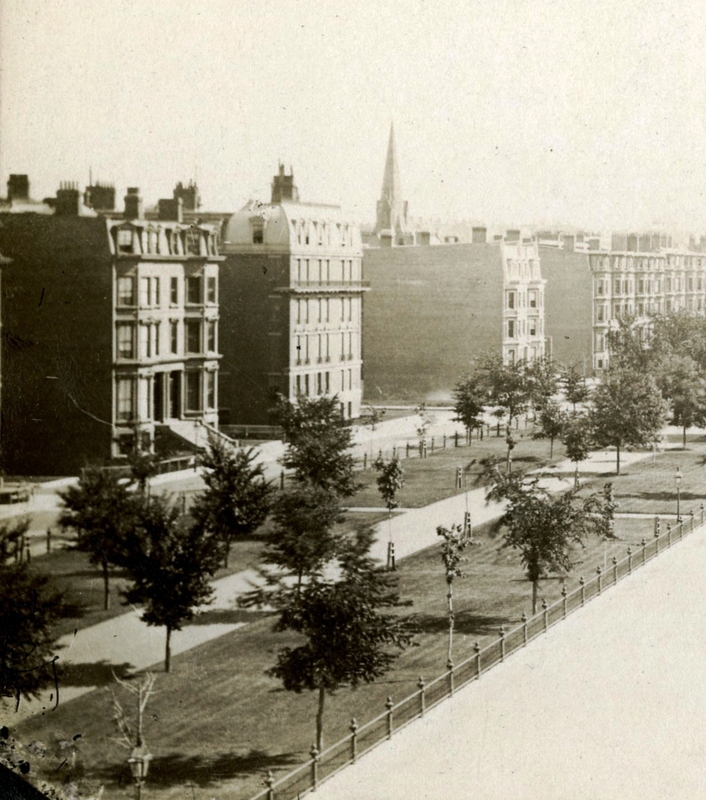 On July 1, 1920, Elizabeth Lyman acquired her brother’s interest in 109 Commonwealth. Henry Lyman died in June of 1934. Elizabeth Lyman continued to live at 109 Commonwealth until about 1940. On April 3, 1940, 109 Commonwealth was acquired by the Town Bridge Club. 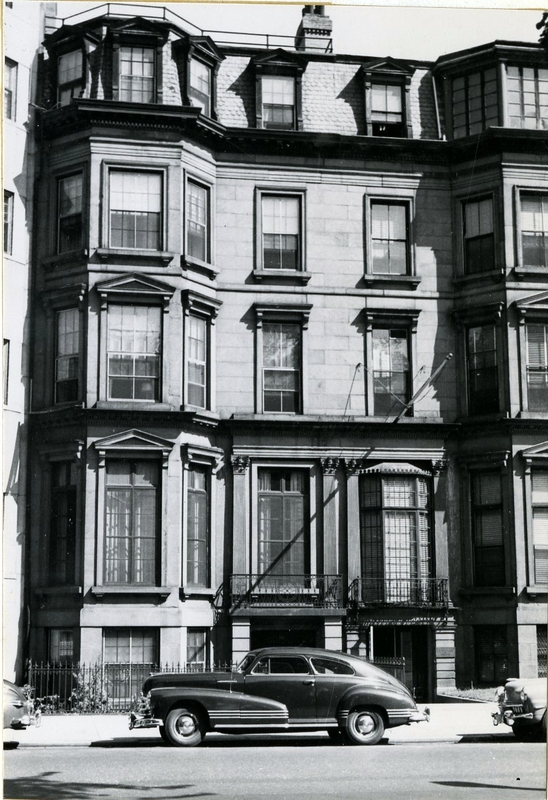 In November of 1940, it changed its name to the Cavendish Club of Boston, and that same month it applied for (and subsequently received) permission to convert 109 Commonwealth from a single-family dwelling into a club building with one residence. 109 Commonwealth continued to be the Cavendish Club until about 1953. On December 28, 1953, 109 Commonwealth was acquired by real estate dealers Robert S. Mitchell and David A. Finn (Finkelstein), trustees of Dartmouth Realty Trust, and on January 28, 1954, they transferred the property into David Finn’s name. He and his wife, Hilda J. (Jacobson) FInn, lived in Newton. In February of 1954, David Finn applied for (and subsequently received) permission to convert the property into sixteen apartments. On March 17, 1962, 109 Commonwealth was purchased from the Finns’ children, Judith (Finn) Viscott, wife of David S. Viscott, and Robert E. Finn, by George V. Buehler. It appears likely that he acquired the property on behalf of real estate developers Robert Leventhal and Norman B. Leventhal, who acquired the property from him four days later. Henry Whitwell offered 111 Commonwealth for sale in a June 14, 1872, advertisement in the Boston Daily Advertiser, described as a “large and elegant new house, furnished throughout in hard wood.” Either the house did not sell or he decided to take it off the market, and by 1875 it had become his home and the home of his brother (and business partner), Samuel Horatio Whitwell, and their sister, Sophia Louisa Whitwell. They previously had lived at 167 Beacon. All three were unmarried. During the winter of 1879-1880, they were joined at 111 Commonwealth by their brother, real estate broker and investor Frederick Augustus Whitwell, and his wife, Mary Crowninshield (Silsbee) Whitwell. They previously had lived at 239 Beacon. By the time of the 1880 US Census, taken in June, they had moved to 237 Beacon to live with Mary Whitwell’s parents, Nathaniel and Marianne Silsbee. Henry Whitwell died in December of 1887. His sister and brother continued to live at 111 Commonwealth until their deaths: Sophia Whitwell in March of 1903 and Samuel Horatio Whitwell in March of 1904. On September 12, 1904, 111 Commonwealth was purchased from the estates of Henry, Sophia, and S. Horatio Whitwell by Anna Kneeland (Haggerty) Shaw, the widow of Civil War hero Col. Robert Gould Shaw, who was killed leading his troops in battle at Fort Wagner, South Carolina. At the time of the purchase, she lived in New York City and may have continued to maintain a residence there as well as at 111 Commonwealth. On March 25, 1905, 111 Commonwealth was acquired from Anna Shaw by her sister, Clémence (Haggerty) Crafts, the wife of professor and MIT President James Mason Crafts. They lived at 59 Marlborough. Anna Shaw continued to live at 111 Commonwealth until her death in March of 1907. After Anna Shaw’s death, James and Clémence Crafts moved to 111 Commonwealth. Clémence Crafts died in February of 1912. James Crafts continued to live at 111 Commonwealth in 1913, but moved to 19 Commonwealth in 1914. 111 Commonwealth was not listed in the 1915 Blue Book. On September 10, 1914, 111 Commonwealth was purchased from Clémence Crafts’s estate by Charles Edward Sampson, a wholesale dry goods merchant. He was unmarried and lived in New York City. He purchased 111 Commonwealth to be the home of his mother, Ellen Constance (Sampson) Sampson, widow of Oscar Hallet Sampson, and his sister, Gertrude Sampson. They previously had lived at 193 Marlborough. 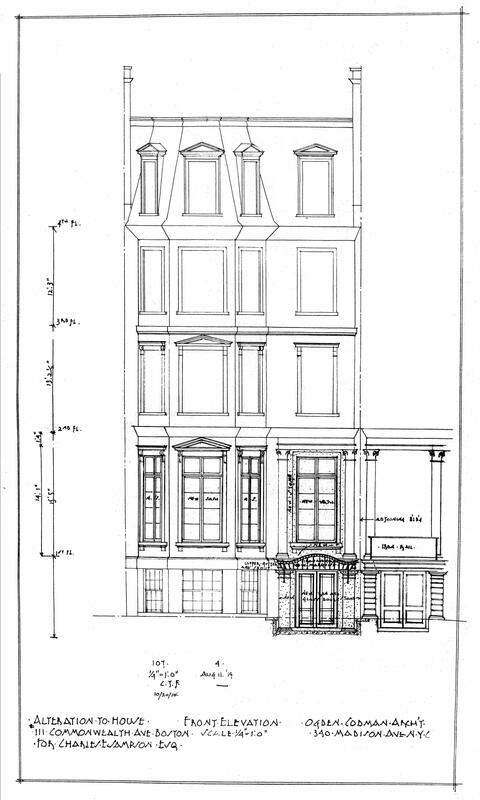 After purchasing the house, Charles Sampson had it significantly remodeled by architect and interior designer Ogden Codman, Jr. Plans for the remodeling — including a front elevation and floor plans — are included in the City of Boston Blueprints Collection in the Boston Public Library’s Arts Department (reference BIN L-9). Click here to view scans of the floor plans for the 1914 remodeling. 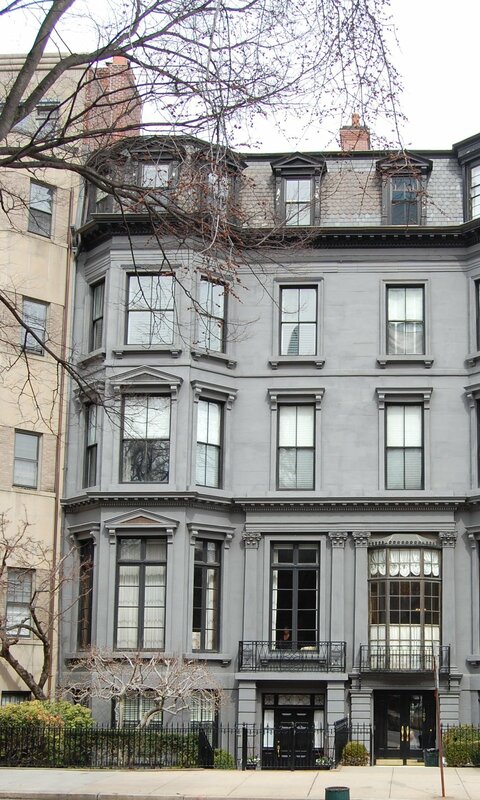 Ellen Sampson and Gertrude Sampson continued to live at 193 Marlborough during the 1914-1915 winter season, and then moved to 111 Commonwealth after the remodeling was completed. The remodeling also included a room for Charles Sampson’s use when he was in Boston. Ellen Sampson died in 1925. After her mother’s death, Gertrude Sampson traveled abroad during the 1925-1926 winter season and then continued to live at 111 Commonwealth. Charles Sampson also made it his winter home. They continued to live there until the mid-1930s, when they moved to New York City (they were listed at 111 Commonwealth in the Blue Books through 1937, but the house was shown as vacant in the 1935-1938 City Directories and was omitted from the 1933-1938 Lists of Residents). On July 27, 1938, 111 Commonwealth was acquired from Charles Sampson by real estate dealer William Randolph Taylor. He was unmarried and lived at 59 Commonwealth with his mother, Susan (Northridge) Taylor Jones, the widow of Thomas Brierley Taylor and the former wife of David Jones. They operated a lodging house at 59 Commonwealth. In April of 1939, he applied for (and subsequently received) permission to convert 111 Commonwealth from a single-family dwelling into a lodging house. By 1941, 111 Commonwealth was the home of Nels Spongberg and his wife, Elin (Villander) Spongberg. They had lived at 54 St. Germain in 1940. They operated 111 Commonwealth as a lodging house. By 1943, they had acquired 197 Commonwealth, which they converted into a lodging house. They continued to live at 111 Commonwealth until about 1945, when they moved to 315 Commonwealth, where they also operated a lodging house. On September 20, 1945, 111 Commonwealth was acquired from William Randolph Taylor by Richard William Langenbach and his wife, Patricia A. (Lambert) Langenbach. They previously had lived in Weston. The continued to operate it as a lodging house. In October of 1945, he applied for (and subsequently received) permission to add a mezzanine floor to one of the lodging rooms to provide space for an additional bed. On March 25, 1948, they transferred the property into Patricia Langenbach’s name. In January of 1952, she applied for (and subsequently received) permission to convert the property from what was, by that time, a combination of a lodging house and six apartments, into twelve apartments. On March 21, 1962, 109 Commonwealth was acquired from George Buehler by real estate developers Robert Leventhal and Norman B. Leventhal. On December 19, 1962, they acquired 111 Commonwealth from Patricia Langenbach. In January of 1962, the Leventhals had acquired the vacant lot to the east, at 260 Clarendon (99-107 Commonwealth), through Guthor, Inc., an affiliate of the Leventhal’s Beacon Construction Corporation. The previous owner of the lot had proposed a 17-story apartment house on the lot but had met with strong opposition by the neighboring residents. 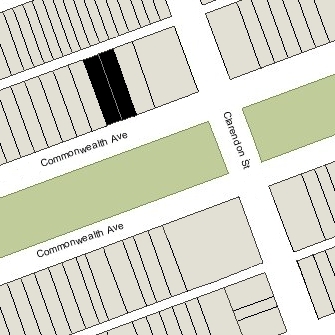 After acquiring 109-111 Commonwealth, the Leventhals proposed constructing an even larger apartment building, encompassing not only the lot at 260 Clarendon (99-107 Commonwealth) but also the lots at 109-111 Commonwealth, which they proposed to demolish. The neighborhood continued its opposition and ultimately the Leventhals abandoned their project. Robert Leventhal died in March of 1972, and on June 30, 1972, 109-111 Commonwealth were purchased from Norman Leventhal and Robert Leventhal’s estate by Howard N. Levin, trustee of the Cavendish Trust. In the same transaction, he also acquired 270 Clarendon. 109 Commonwealth remained sixteen apartments and in June of 1973, Howard Levin filed for (and subsequently received) permission to legalize the occupancy of 111 Commonwealth as nine apartments, which he stated was the existing condition. On October 1, 1986, 109-111 Commonwealth were purchased from Howard Levin by TGF-1 Associates. At the same time, it also purchased 31-33 Commonwealth, also from Howard Levin (as trustee of two other trusts). The general partners of TGF-1 Associates were Wesley E. Finch, Richard N. Houlding, Gloria Chaban, and Robert A. James, Jr. (“TFG” stood for “The Finch Group”). By December of 1986, the general partners of TGF-1 Associates were Edgard Puente and David Boersner. On December 23, 1986, they transferred 109-111 Commonwealth and 31-33 Commonwealth to themselves as trustees of the Boston Commonwealth Trust, and entered into a mortgage with the First American Bank for Savings secured by all four properties. 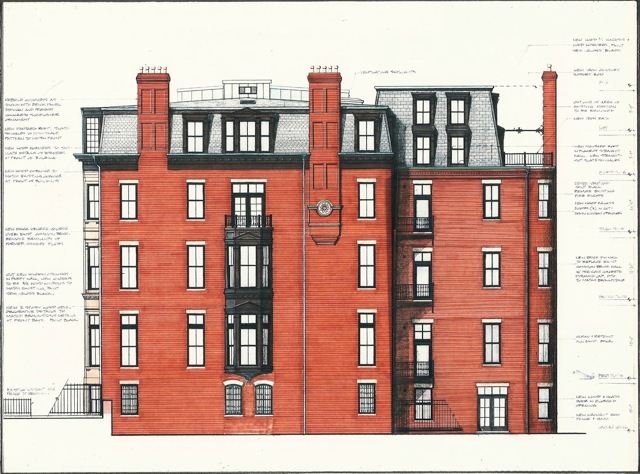 In August of 1987, The Boston Group (presumably on behalf of the Boston Commonwealth Trust) applied for (and subsequently received) permission to combine 109-111 Commonwealth into one property and remodel the combined building into seven residential units. At the same time, they combined 31-33 Commonwealth and remodeled them into twelve apartments and two offices. As part of the remodeling of 109-111 Commonwealth — designed by Tullis Grassi Architects, Inc. — the eastern wall of 109 Commonwealth was significantly altered. Previously a window-less interior party wall, it had become an exterior wall when 107 Commonwealth and 260 Clarendon were razed and replaced by the Clarendon Street Playground. 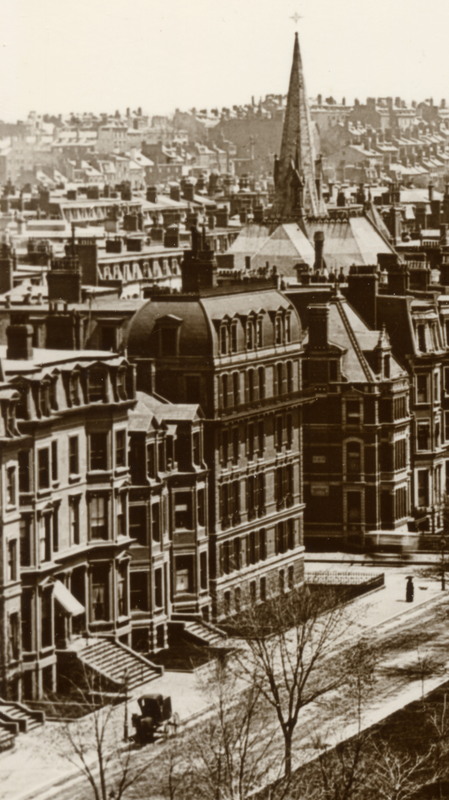 The new design for the wall used other Back Bay end-of-block buildings as a precedent and included a slate mansard roof with wood dormers, brick chimneys with stone trim and clay flue pots, a projecting two-story wood oriel window, and new window openings. On January 30, 1989, First American Bank for Savings foreclosed on the mortgages on 109-111 Commonwealth and 31-33 Commonwealth, and took possession of the properties. On January 11, 1990, the First American Bank converted the 109-111 Commonwealth into seven condominium units, with the address of 109 Commonwealth, The One Hundred Nine Commonwealth Avenue Condominium.